I was recently invited to speak about education at a senior schools conference in Melbourne, Australia, where principals, vice-principals and senior teachers met for the weekend to discuss the future of education. In briefing me about the aim of the conference, one of the organizers said, “We want to break out of the traditional constructs enforced upon us. 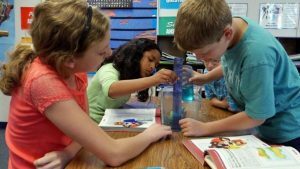 We are really attempting to challenge our governing bodies and constructs that focus on telling us what we cannot do as opposed to allowing creativity and freedom to make an impact on improving student outcomes.” I can work with that, I thought! This is, of course, right up our alley as Neohumanist educators. On the first day of the conference we saw a movie called “Most Likely to Succeed” which further expanded these sentiments, illustrating that the concepts of NHE, as with spiritual and Proutist concepts, are naturally permeating into the collective consciousness of our society. It’s an automatic process inherently tied in with the evolution of humanity on this planet. This article is a summary of the presentation I gave. 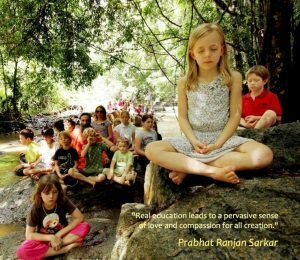 According to Shrii P. R. Sarkar, education is that which liberates the mind. Education should free the mind, not enslave it. It should empower children to be what they ultimately want to be… themselves! We have been conditioned to believe that we need a good job, money, possessions, etc, to be happy. Ken Robinson calls this the idea of linearity; that you go down a track and if you do everything right you will end up set for the rest of your life. This fallacy was created by the early industrialists and has been perpetuated ever since by corporate capitalism. It is at the heart of the industrial system of education that “educates” kids to work as cogs in the machine, prioritizing the subjects most necessary for the industrial complex. But the industrial age has already ended. We are already in the wake of it. The old industrial model of education is no longer relevant, and we now know that industry and the purely mechanistic and materialistic paradigm that we have based our society on for the last 100 years does not make for happy and fulfilled individuals. So we now have a global education crisis, just as we have a global economic, political and leadership crisis. In fact we have an existential crisis where people the world over are questioning the values of the past and challenging the wisdom of expecting round people to fit into a square system. What we are in fact witnessing and living through is no less than the fall of a civilization and a revolution of sorts. The agricultural revolution was 10,000 years ago. The industrial revolution was 500 years ago. The information revolution was 50 years ago. 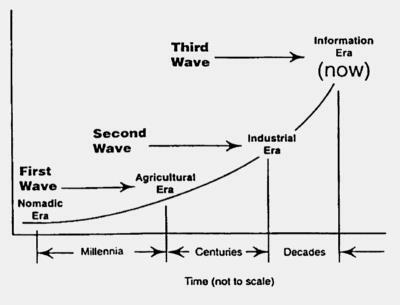 The old industrial model of education that we’ve all grown up with is the remnant of the industrial age that we’ve been in the process of emerging out of in the last 50 years into the information age. But there’s more to come. Human evolution is exponential. If you look at the volume of information we take in daily, it’s about the same as people used to take in in a lifetime 1,000 years ago, even 500 years ago. It’s become so great that we’re now suffering from information overload. So what’s actually happening now is that the speed of our evolution is accelerating and the psychic pressure of information overload is already propelling us out of the information age into a more creative, emotionally connected, intuitive and compassionate spiritual age. We’re currently in the middle of a global shift of consciousness — a revolution — into a truly spiritual age. And education, of course, is a big part of this. 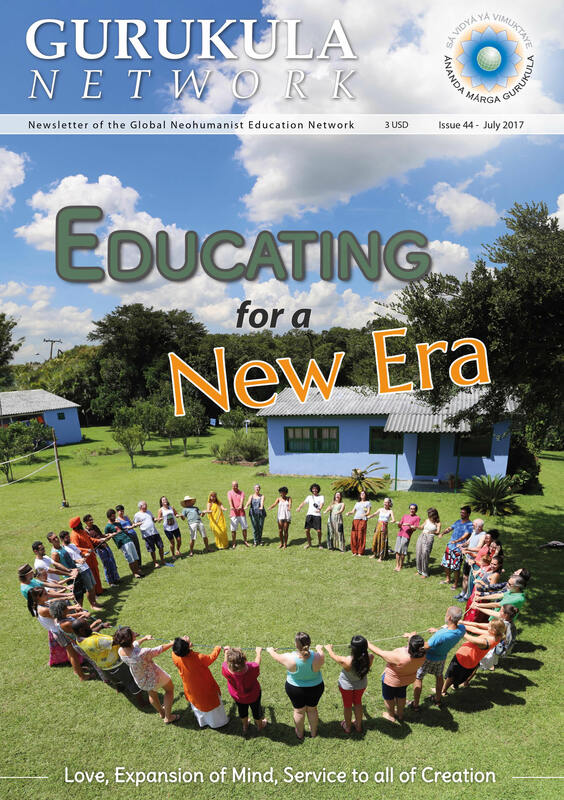 “Our education system is predicated on the idea of academic ability… the whole system of education around the world is a protracted process of university entrance… We need to radically rethink our view of intelligence. Intelligence is diverse. Human communities depend upon a diversity of talent, not a singular conception of ability, and our challenge is to reconstitute our sense of ability and of intelligence. Creativity is as important in education as literacy, and we should give it the same status…. See our creative capacities for the richness that they are, and see our children for the hope that they are, and our task is to educate their whole being. We have sold ourselves into a fast food model of education where everything is standardized and it’s impoverishing our spirits and our energies as much as fast food is depleting our physical bodies. Life is not linear, it’s organic. The reason why people are opting out of education is because it doesn’t feed their spirit; it doesn’t feed their passion. We have to change from an industrial/manufacturing/mechanical model of education based on linearity and conformity, to an agriculture model where we recognize that human flourishing is not a mechanical process but an organic process where all you can do is sow the seeds of possibility. Every day, everywhere, our children spread their dreams beneath our feet, and we should tread softly. It’s not so much the facts but the faculty that’s important. I believe that truly progressive education from now on will teach how to think, not what to think: the faculty of knowledge rather than the knowledge itself; the ability to think and act according to any given situation, not according to set facts or situations. Part of this, of course, will be the knowledge that in the greater scheme of things we don’t actually know a lot. In fact, there’s a saying that the more you think you know, the less you actually know. Increasingly more this will be an intuitive rather than intellectual process. So in actual fact, the ultimate education will teach not so much how to think but how not to think! The movement is from intellect to intuition. This is conceptual education, as opposed to the mechanical learning of facts and figures. It’s an organic process. And because we’re organic (not mechanical) beings, it stands to reason that it’s the way to go. 2. Education must awaken a thirst for knowledge, not force knowledge onto children. And the best way to do this is through play, stories and songs (for younger children) and projects (for older children). If we give children homework instead of play time we will stifle their emotional development which will lead to unfulfilled unhappy adults. 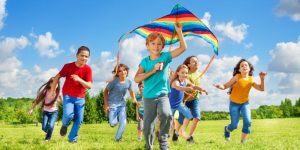 Children express their inherent desires through play which allows them to develop into fulfilled and happy adults. Finland’s minister of education, who presides over the most successful education model in the world, said in Michael Moore’s recent movie Where to Invade Next, “They do not have homework. They should have more time to be kids, to be youngsters, to enjoy life.” When I first returned to Australia in 2011 and was working at one of our schools I was surprised to learn that even primary school children are given homework these days. When I was young we had no homework until secondary school and we used to spend all our time after school playing. Maybe I’m in denial, but I don’t think that was such a bad thing! Project-based learning for older children, giving them space to discover. Rather than a concept divorced from reality, students are given a context within which it exists. Context gives meaning, meaning gives purpose, and purpose gives fulfillment. Whether play-based or project-based, it must be child-centered. 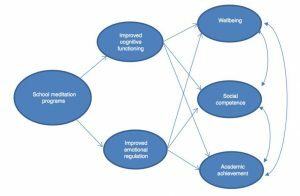 For example, kids teaching kids programs and co-generative dialogue (involving students in decision-making processes within classrooms and schools) both have a positive effect on behaviour, engagement and the emotional climate of classrooms. The academic curriculum acts more as a checklist than as a driving factor. 3. 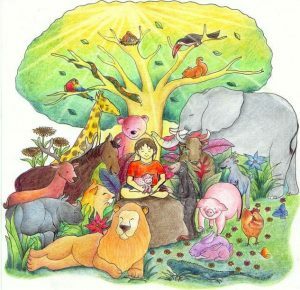 And there is just as much emphasis on the non-academic curriculum, which includes languages, music and the arts, physical education, health and hygiene, social skills (“soft” skills: creativity, critical thinking, compassion, empathy, confidence, communication, collaboration, perseverance, work ethic), ethical values, caring for animals, plants and the planet, helping others, and yoga and meditation. As an aside, in the past there were initiation rites to give a sense of purpose, mission and destiny to children (as opposed to the hopelessness and nihilism that is currently contributing to the anxiety, depression, alcoholism and suicide rates). So in addition, an initiation ceremony to welcome youngsters into adulthood would help to give them a sense of purpose. Indigenous youngsters would particularly benefit from this kind of thing these days. 4. And the example of teachers is also very important. 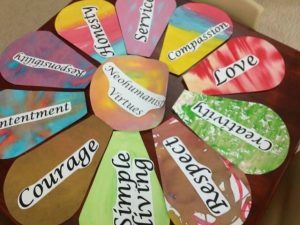 Neohumanist Education is based on the philosophy of Neohumanism: the culture of love for all people, animals and plants, not only of this world but the entire universe. It is a revival of the ancient Gurukula system, where in addition to (in fact, over and above) the academic curriculum, are these three most important aspects of education that are missing from our current education system: These teachings instill young people with the courage, inspiration and sense of purpose to live a fulfilling and giving life. Love is the sweetest and most special feeling of happiness within yourself. Compassion is spreading the feeling of love within yourself to include others. Service is when you express your compassion by helping others without expecting anything in return. Respect is positive regard for yourself and for others. Honesty is using your words and actions for the benefit of others as well as yourself. Responsibility is when you act properly for yourself, others and society. Courage is doing the right thing, whether it’s easy or hard, because you know in your heart it’s the right thing to do. Simple Living is living in the best possible way for yourself, others and the planet. Contentment is being satisfied with what you have and how you live your life. Knowledge is increasing your understanding of yourself, others and the world. These virtues hold much more importance in the overall scheme of a child’s education than academic subjects per se. Always try to do the right thing. Often it will not be the easiest thing to do. But you will realise over the course of time that it was the best thing to do. Keep in mind the spiritual essence of everyone and everything and act on the feeling of that essence. If your thoughts, words and actions are in harmony with that feeling of unity amongst all people and all things, you can’t go wrong. It’s even more important to feel at peace with oneself than to possess knowledge and skills that may be relevant today but not tomorrow; or that you can remember today but forget tomorrow. It’s not what you know but who you know (the who being yourself). Inner peace lasts forever. 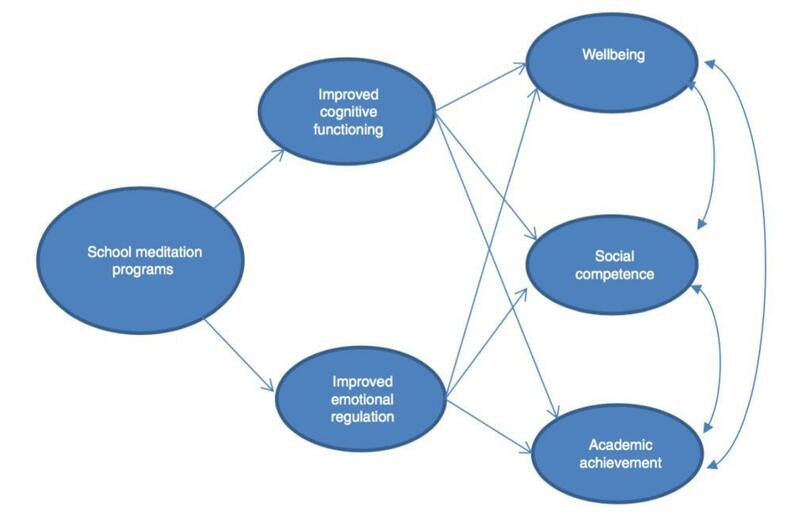 A recent study of the burgeoning meditation-in-schools phenomenon, in which evidence from 15 peer-reviewed studies of school meditation programmes were reviewed, revealed that meditation positively influences student success by increasing cognitive functioning and emotional regulation, leading to wellbeing, social competence and academic achievement. Don’t be afraid to be yourself. Have faith in yourself. People will see you in the same way as you see yourself. Look for answers within yourself. Trust in yourself. Be true to yourself. After all, your true inner self is the self of the entire universe. It’s more fulfilling and important to contribute to the welfare of others than to be overly preoccupied with one’s own welfare. Satisfaction lies in the giving, not the taking. Giving is indeed receiving. Social service is helping those in need without expecting anything in return. This often means that you have to forsake your own comfort for the comfort of others. 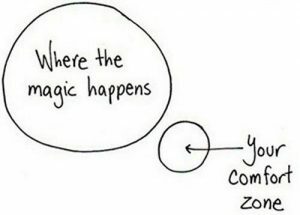 But that’s where the magic happens! So we need children to be educated in literacy, mathematics, in the sciences, in technology, languages, music and the arts, environmental studies, the humanities, physical education, and in all the other subjects that will prepare them for careers in an ever-more complex and challenging world. But above all we need children to develop love for themselves and love, compassion and empathy for others. We need them to feel a sense of connection to their hearts, to all people, to all creatures and to the planet. Practically speaking, ethics, meditation and a sense of service are instilled in children through what we call Quiet Time, a daily session which includes yoga, songs, kiirtan (singing Baba Nam Kevalam – “Infinite Happiness / Love / Peace / Consciousness is everywhere and everything”), meditation, stories, creative expression, games and service projects.